Everyone is looking for ways to save money. Reducing energy costs is a great way to accomplish this. All it takes is making a few simple changes around the house. These changes will help not only now during the frigid days of winter, but will also help during the summer. A simple way to start saving on energy costs is to begin by turning off items that are not in use. For instance, switch off the lights when you leave a room or your home. Turn off your computer, game systems, televisions, and other items that do not have to be on when you’re not at home. Allowing these devices to run continually consumes unnecessary energy, which will increase your utility bill. We live in a time where mostly everyone is technologically savvy. We have smart lamps, thermostats, and other gadgets that help us keep track of what is going on in our home. This technology can be very helpful in reducing energy costs. 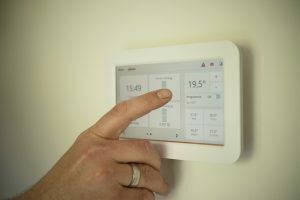 You can control settings on your thermostat for your heating or a/c usage based on whether you are home or away. In addition, not all power strips are created equal. Traditional power strips make it easier to turn multiple devices on and off at once and often include a circuit breaker to prevent overloads. More advanced power strips not only make it easier to control multiple devices at once, but can contain energy saving features such as turning off when devices go into standby mode. If you have a cell phone, a laptop, a camera, or anything that you typically unplug and run out with, you’re more often than not leaving those chargers in the wall. Unfortunately, doing this keeps those chargers powered up, meaning the electrical current is still flowing even if there is nothing connected to it. This wastes a lot of electricity and can cause your electric bills to be higher. Check your furnace filters. Clean filters help furnaces run more efficiently both with heating and filtering out allergens from your home. Change out your filters as recommended for your furnace for best results. If you’re looking to purchase new light bulbs for your home consider using LED lights over traditional light bulbs. LED lights are more versatile, efficient, and last longer due to their better ability to manage the heat they emit. If you are looking to purchase appliances, look for EnergyStar certified products. An excellent resource for tips on saving money by more efficient management of energy consumption in your home can be found in the U.S. Department of Energy’s Energy Saver Guide. Posted January 10, 2018 & filed under Resources.